Based On What We Know, Is The NSA Verizon Request Legal? : The Two-Way A secret court has issued a secret opinion that says yes. We asked legal scholars to look at the law and explain whether they think the National Security Agency's data-collection program is supported by the statute. 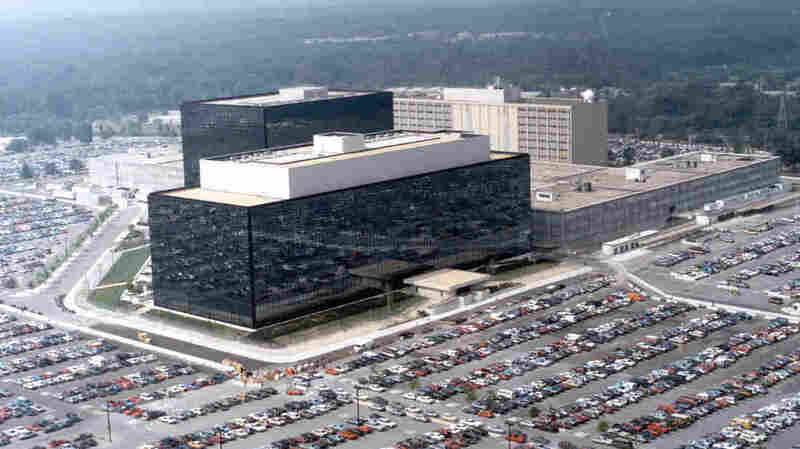 The National Security Agency's headquarters in Fort Meade, Md. Here's what we know about a National Security Agency program that collects vast amounts of data on the electronic activity of Americans: While controversial, a leaked secret document authorizing the collection makes it clear that the Foreign Intelligence Surveillance Court has decided that the collection of metadata for every call made in and into the United States is legal under Section 215 of the U.S.A. Patriot Act. What we don't know is why. That's because the opinion of the FISC is secret. In an effort to get some kind of answer, we asked legal scholars to interpret the so-called business records section of the post-Sept. 11 legislation to determine what in it could — or could not — justify the government collection of three months' worth of all Verizon phone calls made in and into the United States. By all appearances, the program does not easily fit within the Patriot Act. The provision cited by the court allows the government to petition for access to "business records" that are "relevant" to "an authorized investigation" to "protect against international terrorism." If the NSA is gathering billions of daily phone records, only a sliver will be relevant to any specific investigation. The gathering of the rest would seem to go too far. Having said that, I could imagine a reasonable interpretation of the statute that allows for the data dump, especially if bound by so-called minimization procedures that control how the data are actually used. The problem is that the FISA court's interpretation of the statute is secret. We do not have access to the court's explanation of how the law allows this surveillance. So the secrecy of the surveillance is not nearly as troubling as the secrecy of its justification. Democracy can survive the former and could be eroded by the latter. We'll add that the administration — Director of National Intelligence James Clapper, NSA Director Gen. Keith Alexander and FBI Director Robert Mueller — have all focused on that "minimization procedure." That is: They say they collect the metadata, but they don't look at it without further permission from the FISC. The government apparently has obtained orders, issued by the secret Foreign Intelligence Surveillance Court (FISC), requiring the major American telecommunications companies to produce records regarding all of the telephone calls of all of their subscribers. According to the Director of National Intelligence, the government does not actually "query" this information unless it first demonstrates to the FISC that the subject of the query may be associated with a foreign terrorist organization. But section 215 of the Patriot Act does not permit this "collect now, establish relevance later" approach. It requires the government to "show," in its original application to the FISC, that "the tangible things sought" — all of them — "are relevant to an authorized investigation ... to obtain foreign intelligence information ... or to protect against international terrorism or clandestine intelligence activities." The FISC judge may issue an order only if this requirement is met. Needless to say, all the telephone records of all Americans are not relevant to a specific foreign intelligence or counterterrorism investigation. Why, then, did the FISC approve the government's program? It presumably determined that the government's approach was consistent with the purpose and spirit of the law, if not the letter. But that was a mistake. Once information is in the government's possession, we must rely on the government to police its own use of the information, as neither Congress nor the FISC has any way to determine whether agencies are improperly querying the data. Transferring this policing function from the FISC to the government violates a core purpose of Section 215. Unfortunately, the ordinary mechanism for correcting erroneous judicial opinions — appeal to the higher courts — is unavailable when dealing with a secret judicial body. Even in the rare instance where a decision is leaked, the government is usually the only party, and the public has no right to appeal. The recently leaked documents by Edward Snowden have given cause for concern that these tools are not being targeted at one or a few potential targets, but rather being used to cast a wide net of potential phone calls, and then from those large number of phone records, discover several potential targets, and then seek a warrant from the FISA court to further pursue the alleged terrorist activity. Several U. S. Congressmen, several of whom helped author the Patriot Act, have asserted that this goes beyond the intention of the Congress. Thus, without seeing the actual evidence, and intelligence gathered (and other case information), it is incredibly difficult for anyone to determine whether gathering all phone records from one company for a three month period is actually a violation of the law. Regardless, this does display the potential ambiguities in the "business records" provision of the law (the FBI filed 212 requests to the FISA court for such data last year alone — up 1,000 percent from four years ago) and possibly the weaknesses of the current judicial system used to review such requests. The FISA court, one would hope, would be best able to determine if the requests have exceeded the statutory, or even Constitutional authority, provided for within the Act. Without question, the issues the court now faces are increasingly complex and much different from its original charge. The FISA court was created in the 1970s — well before we had the threat of al Qaida and like-minded affiliates attacking the United States or its citizens. These ambiguities seem to reveal the need, once again, to review the effectiveness of the FISA court as currently constructed. Similar potential problems have emerged with regard to the detention and trial of al Qaida fighters, national security letters, and other legal issues surrounding the so called war on terror. Perhaps, as myself and others have asserted over the past decade, it is time for the Congress to modify the court and create a standing national security court. One could envision one element of such a court to have national security law experts (not truly in existence at the time the court was created) to be appointed and better serve the needs of policy makers as they struggle to attain the delicate balance of U.S. citizens civil and human rights, and still provide for the national security of the nation. An interesting point to come out of the hearings on Capitol Hill is one brought up by FBI Director Mueller, who said metadata weren't protected by the Fourth Amendment to begin with. We asked Greenfield if that suggestion from Mueller changed his thinking about how the FISC may have structured its opinion on the case. He said, "No." "The Fourth Amendment doesn't bear on the reading of the statute," Greenfield wrote in an email. "While the Supreme Court hasn't ruled definitively on the Fourth Amendment issue, I think Mueller is probably correct that the current Court would not consider metadata 'private'. What matters is whether the statute allows the government to demand this data under the statute, and keep it secret."